Although no one needs a bunch of tools and equipment cluttering their garage or shelves, the new Black & Decker cordless jumper air station does more than just save space. With the ability to inflate everything from car and bike tires to rafts, mattresses and beach balls, the Black & Decker ASI500 12-Volt Cordless Air Station Inflator is the most versatile inflator on the market. A digital pre-set pressure gauge with an auto shut-off feature and backlighting allows you to get within +/- 1 PSI of your required inflation pressure to avoid over/under inflation or blowouts. The ASI500 also features a quick connect hose and on-board accessory storage so that you can easily keep track of all of your cords, needles and hoses. Most impressive, though, is the convenience the ASI500 provides. Once fully charged, the ASI500 becomes completely cordless and can be taken virtually anywhere – the soccer field, beach, camping – it goes where you go! Taking a road trip? The ASI500 can even charge from your vehicle’s DC accessory outlet! 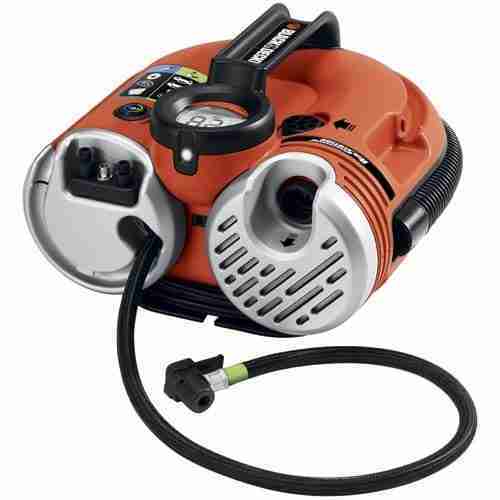 The Black & Decker ASI500 – quite possibly the best thing to happen to portable inflation since air itself. I was able to purchase mine for $69.99.